First of all, when you google about this story, the story that uses git of msys2 gets mixed, there is no googleability. (en)After buildin bash-login.go with go, specify the completed exe as follows. Well... build with go ...? I feel lazy even if I need to build only once. Moreover, it is ridiculous to use VSCode extension to resolve it. WTF! Specify full-path for bash. Be careful not to specify the bash not part of msys2(ex. the bash of git-bash). You can set environmental variable when create process. Every MSYS2 user will know that MSYS2 has 3 mode, MSYS, MINGW32, MINGW64, and $PATH is also(/usr/bin, /mingw32/bin, /mingw64/bin). MSYS is almost only for creating msys2 package. MINGW32 is based on the gcc that exception model is dwarf, not SEH, due to patent of Borland, for i686. For flags that decide whether to set the working directory to the path of environment variable $HOME when logging in to bash, setting it to 1 prevents movement. 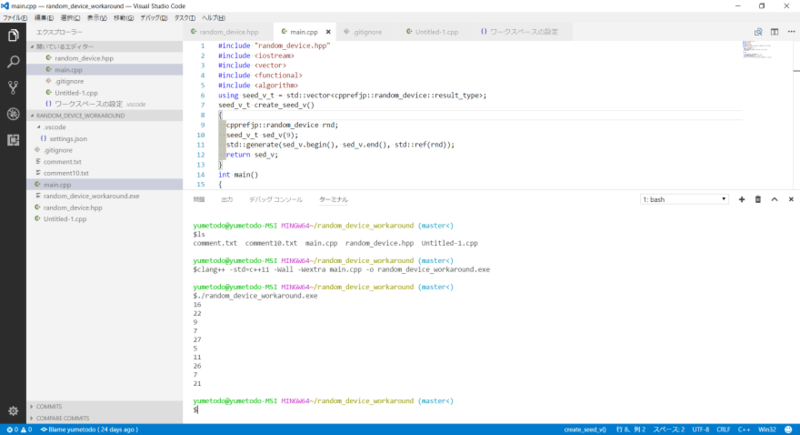 Well, msys2_shell.cmd's code is too unreadable, so it's unavoidable if they did not understand. Passing --login, -l will same effect. Now, let's read man bash. To summarize, if you do not pass -l or --login, ~/.Bash_profile will not be loaded. Specify the style of cursor of terminal. The default is "block". I like line-style so that specify "line".